AFRICANGLOBE – Zimbabwe has been elected First Deputy Chair of the African Union (AU) at the 22nd Ordinary Session of the General Assembly which recently ended in the Ethiopian capital, Addis Ababa. Zimbabwe’s election followed its secondment by fellow southern African states and this means the country is likely to assume the rotating AU chairmanship next year. Zimbabwe’s election puts it in the five-member AU Bureau of the Assembly of Heads of State and Government which will be composed of Mauritania (chair), Zimbabwe (First Vice-President); Democratic Republic of Congo (Second Vice-President) and Nigeria (Third Vice-President). The DRC also assumed the responsibility of rapporteur. The Bureau is the AU’s supreme organ, tasked with steering the agenda of the continental grouping. Zimbabwe’s elevation to the AU Bureau is a slap in the face for the European Union which had decided not to invite President Mugabe to a summit of the two continental blocs scheduled for Brussels in April. The AU Executive Council resolved that the Europeans should not be allowed to dictate to African Heads of State and Government who should or should not attend the Brussels Summit. The resolution will be tabled for adoption during the 22nd Ordinary Session of the AU General Assembly today. This principled position by the AU is not only an honour for Zimbabwe but a ringing endorsement of President Mugabe’s appeal and exhortation to African leaders in Ethiopia this week to re-examine the continent’s relationship with former colonial powers. 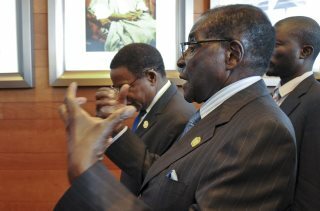 President Mugabe appealed for unity and closer co-operation among African states if they wanted to achieve development. He told an AU Foreign Ministers’ retreat that the number one priority to development was control of natural resources. “We have given our resources to our erstwhile enemies and that is the situation in every territory,” the President said. He lamented the fact that the West was allowed to interfere at will in the affairs of Africans because they were not ideologically united. It was therefore important, the President said, for the continent to unite and say “no” to external interference. Given President Mugabe’s ability to articulate the problems of the continent and his bold stance against the machinations of the West, there is no doubt that in him the continent finds a voice which can speak without fear about what is good for Africans. Zimbabwe has already set on a bold development trajectory by taking over from White invaders land which had been seized from Africans during nearly 90 years of colonial minority rule. Thus when the President talks about the need for a bold leadership, he is talking from a position of practical experience fully conscious of the vicious retribution from America and her allies. This also comes at time when European countries and the United States are engaged in an insidious bid to try and stop the spread of resource nationalism as they scramble for African land, minerals and skilled labour. President Obama has already invited 47 African states to its own summit to discuss what he calls security and development on the African continent. According to media reports President Mugabe has not been invited to the summit allegedly because he is on the sanctions list for democratic deficit in the country. There is no doubt that those who have elevated Zimbabwe to the high position on the AU ladder appreciate fully these divide and rule tactics of the United States and the European Union. They will need to challenge any bullying and the patronising attitude that Africa has to be invited for lectures in Europe and the United States on how to run its affairs, how it can develop by the same countries which never get weary or ashamed of pillaging its resources and burdening the continent with crippling debts in return. On Zimbabwe’s election to the First Vice Chair, Foreign Affairs Minister Simbarashe Mumbengegwi said this was an expression of confidence in Zimbabwe and that the country would be in the running for the chairmanship of the AU next year. Minister Mumbengegwi pointed out that it would be ridiculous for the EU to maintain its stance that President Mugabe cannot attend its summit in Brussels given his position in the AU. There would be resistance from fellow African members. Especially once the AU adopts the resolution that Africa cannot be dictated to anymore on who should attend the EU-AU summit. Days of divide and rule might finally be coming to an end once African leaders appreciate their common destiny and the devious designs of imperialist terrorists.